Genuine Durham Smoking Tobacco, later known as Bull Durham, was manufactured in Durham, North Carolina from as early as 1860. (The trademark was first registered in 1866.) John Ruffin Green is credited with adopting the bull (apparently borrowed from Colman's Mustard (made in Durham, England)) as a symbol for a smoking tobacco known as Best Flavored Spanish Smoking Tobacco. Green then changed its name to Genuine Durham in the 1860's. Green's successor was W. T. Blackwell (1839-1904), whose company W. T. Blackwell & Co. was succeeded by Blackwell's Durham Tobacco Co.
Julian Shakespeare Carr (1845-1924), while first part owner (from around 1870), then sole owner of Blackwell's, is credited with engineering the massive advertising campaign that spread the Bull Durham signs over the American landscape. Bull Durham signs featured a bronze bull on a black background. In the sign above, the bull was probably in the lower right corner but is not discernable now. A circular Gold Medal Flour sign was painted over the middle of the Bull Durham sign at some point in time, and is now quite a bit less prominent than the larger BULL DURHAM lettering. 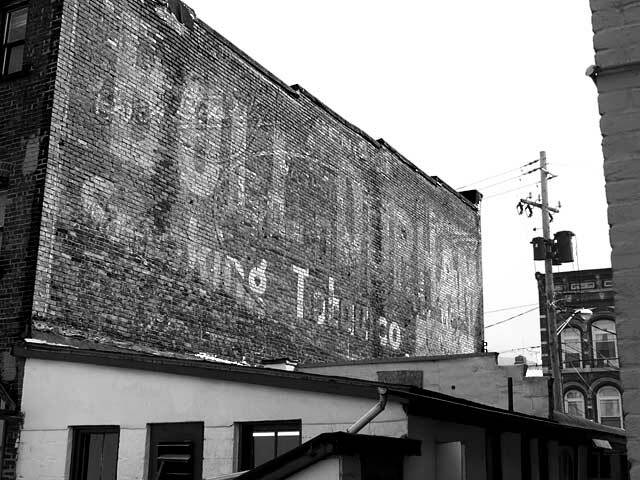 The successor to Blackwell's Durham Tobacco Co. was the American Tobacco Co. which paid somewhere between 3 and 4 million dollars to take over Blackwell's (and the Bull Durham trademark) in 1898. Bull Durham was sold as loose tobacco in a roll-your-own packet, and continued to be manufactured until around 1988. Click here for ad from the 1914 Saturday Evening Post. Click here for another Bull Durham sign, this one from San Francisco (1990). Here you can see the bull, but it is partially blocked by billboards. This Bull Durham from Spokane, Wash. (2005) has been mutilated by a modern garden scene. In the photo above the circular element in the middle of the sign is the vestige of a Gold Medal Flour sign (probably painted later than Bull Durham). The word "Flour" can be made out over "Tobacco" at the bottom.